In four weeks, I’ll be in the wonderful position to be en route to Florida for two weeks of sun, theme parks, food and most importantly SHOPPING!! Beauty shopping in the U.S. is extremely exciting for us Brits. I love stocking up on the products that we can’t get over here and in my humble opinion, no trip to the States is complete without a trip to Sephora, aka Beauty Mecca. In order to control myself, and stop myself from spending the rent money, I have had to compile a few wish lists. I love to read about what others have on their wish lists, so, for the next four weeks, I thought I would share with you all one of these type wish lists in a weekly Sunday feature in the run up to take off. 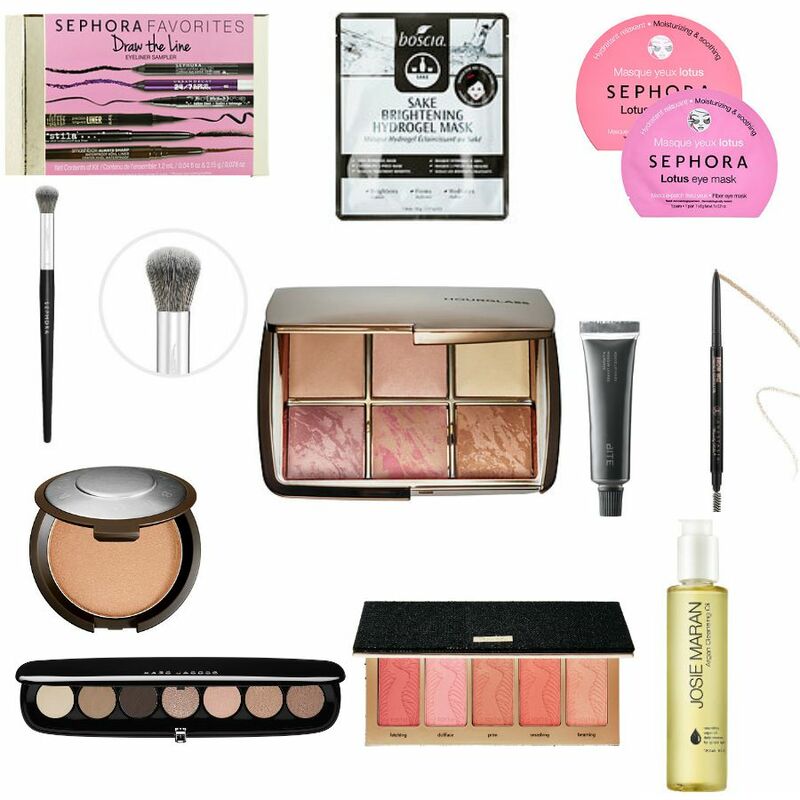 So, without further ado, here is what is currently top of my heart’s desire in Sephora…. I loove the Sephora Favourites value sets. They truly are excellent value and a fantastic way to try several new products at once. This kit contains six of Sephora’s best selling eyeliners, with three full size products (!) and with a $88 value for $30, it’s a no brainer and is going straight into my basket. The sampler contains, a deluxe sample size of Kat Von D’s infamous Tattoo liner; a deluxe size of Sephora Collection Contour Eye Pencil 12HR Wear; a full-size Smashbox Always Sharp Waterproof Kohl Liner; a full-size Stila smudgestick Waterproof Eye Liner; a full-size of Tarte’s lights, camera lashes precision longwear eyeliner and a deluxe size of Urban Decay’s 24/7 Glide-On Eye Pencil. The deluxe sizes of these products are also great for throwing in your handbag. I am a big fan of sheet masks. Even though they can make you look pretty terrifying, I really feel like they do the job whenever I use one. I have never tried anything from Boscia, so I plan on popping a few of these sheet masks in my basket to try. This mask is meant to firm, tighten and brighten the skin, so I look forward to putting it through it’s paces. Recently, I have been having terrible trouble with dry patches around the contours of my eyes so I have been testing lots of different products to try and clear it up. These patches are only $5 each, so are a steal compared to my trusty Rodial Dragon’s Blood Eye Masks. I will stock up on a few of these for Sunday night bath time when we get home. I have never tried any of Sephora’s brushes, but have read great things online about them, so I look forward to giving this a go if I can get my hands on it. This brush looks super fluffy, so I plan to use it for setting concealer on my under eyes. Originally, I had the ambient lighting powder palette on my wish list, but when this dropped in the holiday gift sets, I quickly replaced it for this. This palette not only looks beautiful – that packaging…. At $80, it does seem pretty steep but the palette would cost $132 to buy everything separately so, it’s just good economics! I already know that this palette is extremely popular, so I’m really hoping that I manage to get my hands on it. Not only will this be great for Winter, but I have a few liquid lipsticks on my drugstore wish list, and the lovely Nicole Guerriero shared the excellent tip of using this lip mask before applying a liquid lipstick to keep lips moisturised and fight the drying effect that some can have. I haven’t tried this very hyped up product yet, and really look forward to forming an opinion on it and comparing it to my much loved Mac eyebrow pencil. This was another product that went high up the wish list when it was released. I originally wanted the skin perfector in Moonstone, but when I seen swatches online of this, I had to have it. Everybody has room for another highlighter in their lives, right? Once again, that packaging!! Swoon. This palette has seven gorgeous colours, with a great balance between matte and shimmer shades. I think this palette will prove very useful for creating beautiful day time looks for work that can transition easily to night time looks. This palette is also a holiday limited edition palette, but contains five full size blushes that usually cost $28 each, so at $44, it’s a steal. Tarte’s blushes are said to be extremely long wearing, something I look for, as I am not a fan of numerous touch ups throughout the day. The palette looks sleek and compact, so I think this will also prove great for travelling. Winter can play havoc with my skin. As does sunshine and long haul flights, so I think by the time I get back from Florida, my skin will be crying out for a boost of deep hydration. I love cleansing oils as I find they melt away make up so easily with the additional benefit of a moisture boost. Argan oil is also good for dealing with hyper pigmentation, so I look forward to trying this out to see if it makes a difference to my nose area where I suffer from hyper pigmentation. What would you all have on your own Sephora wish lists? Let me know if you think there is anything else I absolutely must try….